THE TORIES have been forced again to make concessions on the anti-Trade Union Bill that had even former Tory Home Secretary David Davis comparing some of the clauses to laws passed by fascist Franco in Spain and threatening to vote against the Bill at its third reading unless it was changed. Business Secretary Sajid Javid on Wednesday announced a big climb-down on some of their proposals to restrict picketing and protest. The Government has now dropped its proposal to force unions to publish a protest and picketing plan 14 days in advance. This would have made unions spell out in great detail how they planned to campaign during a strike. It would have given employers and the police two weeks’ notice of everything the union planned to do — where and when pickets would be held, how many would attend, even whether megaphones would be used. And it would have made unions declare online how they would campaign, including what they were intending to post on Facebook and Twitter. And if they did not comply unions would have been liable for fines of up to £20,000. The Government decided not to go ahead with proposals to create new criminal offences around picketing or to make every picketer wear an armband or give their name to the police. But picket organisers will still have to wear an armband and give their name and address to the police. And they’ll still have to carry a standard letter from the union authorising the picket. 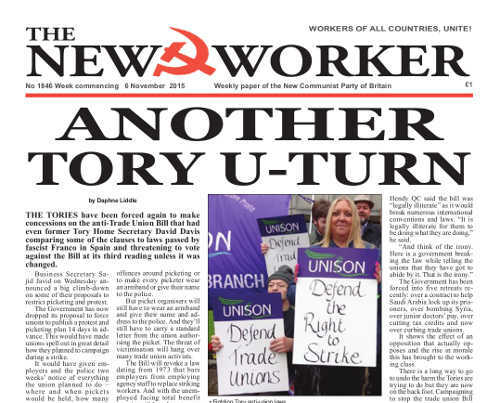 The threat of victimisation will hang over many trade union activists. HUNDREDS of members of families who have lost a close relative through a death in custody gathered on a corner of Trafalgar Square last Saturday with banners, placards and leaflets to commemorate their loved ones, and to demand an end to deaths in custody. Since 1990 a total of 1,518 people have died in custody and their families are demanding justice. Some died in police stations, police vans, prisons and secure mental hospitals. All had died needlessly; but in every case the killers have not been brought to justice. The victims included: Sean Rigg, Seni Lewis, Jimmy Mubenga, Roger Sylvester, Shehu Bayoh, Rebecca Overy, Ricky Bishop, Jason Thomson, Paul Coker, Thomas Orchard, Joy Gardener, Kingsley Burrell and many, many more.